The Sales Invoice Templateis a document issued by the seller of a product to the buyer, charging them for the items purchased. The invoice provides a record of the amount of product sold, who it was sold to, the date it was sold, and the payment timeframe for the buyer of the goods. The sales invoice increases the organization of the buyer and seller, resulting in more efficient tax filing. To complete the sales invoice in either PDF, Word, or Excel format, follow the step-by-step instructions below. Download the Sales Invoice in Adobe PDF or Microsoft Word. 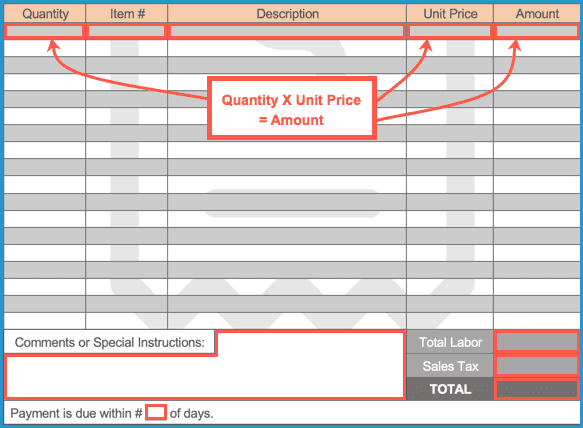 In the table, begin by entering the Quantity (number) of items purchased, followed by an Item # (if applicable), a short Description of the items purchased, and the Unit Price of a single item. Multiply the Quantity by the Unit Price to calculate the Amount for each item. Sum the values in the Amount column to calculate the Total Labor cost. Then, add on any Sales Tax to calculate the TOTAL invoice amount. At the bottom of the page, write in any Comments or Special Instructions. This can include accepted payments or any clarifications on listed prices. To complete the invoice, enter the Number of Days the client has to pay the invoice in full. Download the Sales Invoice in Microsoft Excel. 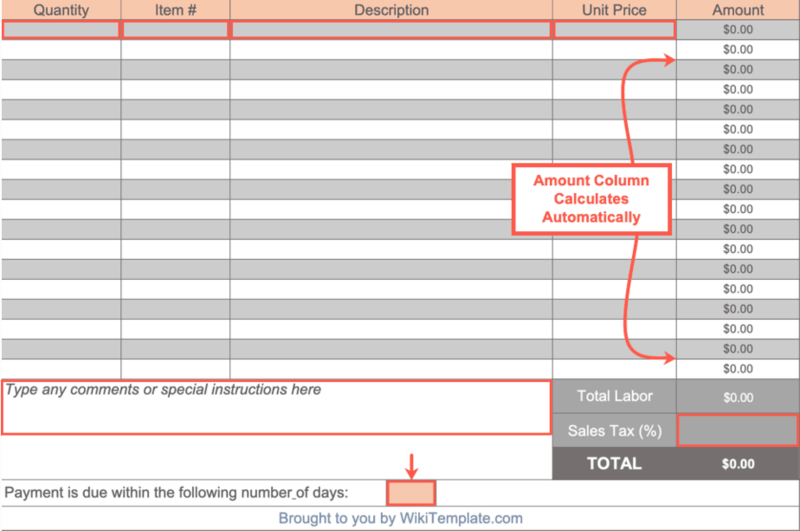 The Amount column will automatically multiply the Quantity by the Unit Price for each product entered. Next, enter any applicable Sales Tax (as a decimal) into the designated field. The TOTAL value will then be displayed. To complete the invoice, enter any Comments and Instructions for the client followed by the number of Days until the invoice is due (from the issue date).